For the Toraja, death is the central part of the life, and funerals are the most important social event for the community. Funerals are also a way to get a good influence (on agriculture) from the deceased. When someone dies, he is kept in his house in a special room and considered as sick until he can have a proper funeral, sometimes months or even years later. Every day, the family will bring their dead relative food, change his clothes, light his cigarettes. A person is not considered as dead until at least one buffalo is sacrified – the soul of the buffalo is believed to accompany the soul of the deceased; before a buffalo is sacrified, he or she will not be able to rest in peace and reach the paradise. 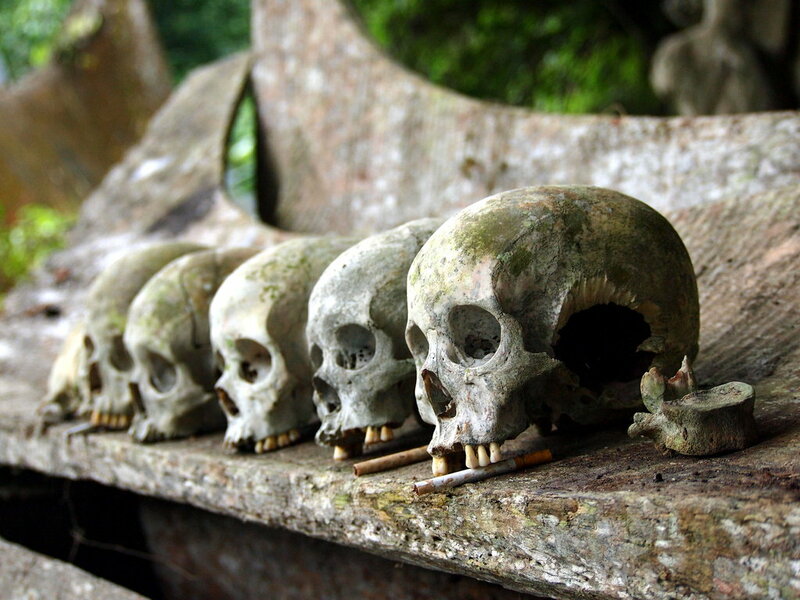 After the funerals, Toraja people keep their dead relatives inside rock graves. The graves are built in high cliffs or huge rocks, sometimes only small holes, sometimes big caves inside which bones and skulls are kept and one can walk to visit the family. The higher the bones are kept, the higher class the deceased belongs to. Sometimes, wood coffins are hanging outside, or bones are simply kept outside along the cliff, sometimes surrounded by offerings like cigarettes.